This idea for this MUD was made by Ichike, the current owner, coder, and head immortal. I was watching TV and stumbled upon Naruto and was just blown away at how great it was. We only got a few episodes for the season, but it was just so tantalising. I had never seen anything like it. The drama. The beneath the underneath. The whole thing was just awesome. Then I eventually found all of the English episodes on MySpace. Not long after that, I found the Japanese episodes with English subtitles, also on MySpace. Then I decided that I needed something more. I found a bunch of web forums for Naruto, which had their own roleplaying games, but that really wasn't my thing. There were probably web-based games too, but I didn't think that that was right. Seeing just how incredibly popular Naruto was (number 1 Google search item for 2007, and top hit on Wikipedia for 2007) I thought that surely someone had written a Naruto MUD. Even though MUDs aren't all that popular compared to MMORPGs, pretty much every game, movie or popular concept has a MUD based on it, so I was sure that there was one. I eventually came across a MUD but was so disappointed in it that I felt that I just had to do better. I felt that, no matter how badly I did, I couldn't do as bad a job as they had. I thought that I could make a MUD that represented what people wanted. A MUD where it had characters from the show, areas from the show, skills from the show, concepts from the show. And a MUD which encouraged new players, rather than hating them. I set up my rules first and foremost and decided on rule number 1: Have fun. Then rule number 2: Don't ruin the fun of others. The others were just added to make the game workable. I could have just about say "and the same rules as every other mud in the planet" for the rest. Making a rule to have fun I thought was important. If people are going onto a mud crying and complaining, then it wrecks it for everyone else. Similarly, if someone is having fun at the expense of others, it also wrecks it. We should have fun. I similarly decided that for imms they could do what they liked so long as it didn't interfere with players. They weren't required to build. They could sit around doing nothing all day. I know how nasty it can be with imms required to do lots of work. If imms went AWOL then they wouldn't be demoted - we'd just get another one. They should have fun so that the whole mud feels like fun. I thought that this was important and would make the mud great. I also thought that we should try to get players involved in the mud as much as possible. The first way to do this was to reward people for any bugs that they find or for any ideas. We eventually found a code to download called award code, which meant that we could give mission points for this. We also eventually added in leadership code too. Whilst I wanted to keep as sole coder the whole way through, I nonetheless wanted people to feel like it was their mud, and that one of the big rewards they could strive for was to be Hokage (or Kazekage, etc). This was important. Another aspect was the no-penalty promise. As the mud was being developed, we would add things. Older players, I promised, would never be penalised for it. When we added new skills, or renamed skills, we either gave old players practice points or else gave them the new skills, to be fair to everyone. Similarly, when we recently changed the max stats from 25 to 75, we allowed players to "reroll", to be advanced 1 level at a time up to their current levels, with the new stats. Balance was also a key. Whilst the show might suggest at various points that one way of doing things was better or stronger, we had to make sure that we interpreted things in a way that made things equal. I did actually stuff this up at one point, when I mass-added Taijutsu, then mass-added Genjutsu, then was going to mass-add Artist, only some skills didn't work so I had to give up. I had already added lots of Ninjutsu before all of that. Things are heading towards balance now though, although there is still a little way to go. For this reason, sharingan isn't being added now (nor are any of the clan-only skills or kekkei genkai skills), not because they are too difficult to do but rather because they are too hard to balance without knowing what the other skills are like. Sharingan is incredibly easy to write the code for, but making it balanced would be tough. Perhaps one day someone will make a Uchiha mud and not have this problem. Finally, we promised to include *EVERYTHING*. Whilst we will at various points invent our own ideas, this will never be at the expense of things actually in the show. Some things will be interpreted differently to others, some will be stronger or weaker than what you might expect, but they will all be in there in some form. Every character will be there. Every area will be there. Every skill will be there. Every concept will be there. The only reason that we will add in our own inventions is basically to fill in the gaps, for balance reasons. Land of Rice Fields wasn't really described well in the series, and as such we invented our own interpretation of it. We created a few characters and a few skills too, for balance reasons. Some people, ultimately, think that we have interpreted it poorly. For example, why do we have a Ninja Artist spec, when there are only 3 types of ninjas - Ninjutsu, Genjutsu and Taijutsu? Why do we have blood summons work in that way? Why is Kusanagi a blood summon? In the end, though, this is an interpretation. There is no right or wrong when it is an interpretation of how things work. If you don't like one, perhaps the next one will be interpreted in a way more to your liking. 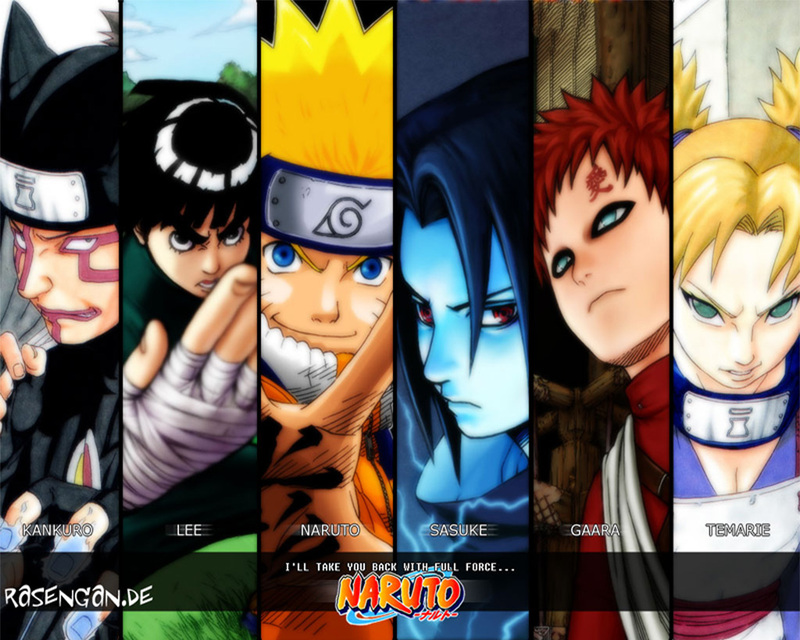 In the end, our ultimate aim is to have a place that looks and feels like Naruto's World. That you can feel like you are living and breathing in that world. Hopefully one day we can achieve that aim.